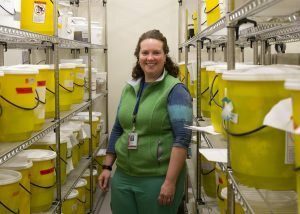 CU School of Medicine Pathologist Carrie Marshall, MD, in the Organ Room of tissues used for training and outreach. Toni Schoenleber couldn’t do her job as a stroke clinical coordinator at UCHealth University of Colorado Hospital (UCH) if she didn’t have brains. In fact, it’s because she has brains that she knew just where to go when she needed more brains. She called Alison Grice, who manages the Medical Teaching Lab at the University of Colorado School of Medicine. Schoenleber picked up six brains and, on March 15, gave two dozen Emergency Medical Services providers from across Colorado a chance to see what actual stroke-damaged brains look like. 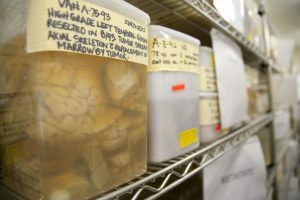 The Organ Room’s specimens range in age from recent to decades old, as is the case with these brains. cancer. When the correct answer comes, she then removes from a bucket sloshing with cancerous organs a lung with enormous, fatal tumors for the students to observe and, if they like, hold. “It’s an experience you don’t forget,” Marshall says. She says this in what she and Grice call the Organ Room. It’s in CU’s Research Complex 1 North building, a short walk across 17th avenue from UCH. Inside are tall metal racks. On their shelves are hundreds of yellow and white buckets and dozens of semi-translucent, Tupperware-like tubs. The buckets are taped with labels including ID numbers and descriptive labels such as inflammation & repair, Pulmonary, Renal, Heart, Placenta & Pregnancy, Lung, and Lower GI. They contain lungs with cystic fibrosis, ulcerated esophagi, ruptured spleens, diabetic kidneys, post-heart-attack hearts, brains with multiple sclerosis and Alzheimer’s disease – as well as healthy organs for comparison. 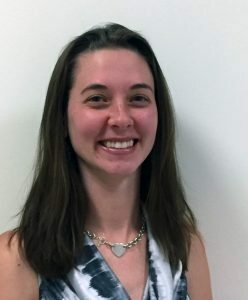 Alison Grice, the CU Anschutz Medical Teaching Lab manager, is working with Marshall to extend organ outreach. The samples’ ages vary widely. This bucket includes ones harking back to 1984 and as recent as 2017. Part of the organizational effort was to inventory the buckets’ contents and discard samples ruined with age or excessive handling. Marshall has also made strides in enhancing and renewing the collection. Surgeries are one source; another is clinical autopsies of the sort Marshall regularly does. Patient and families have consented in all cases. Marshall herself performs clinical autopsies, whose purpose is to advance medical science through a thorough understanding of the disease processes that led to the patient’s death (not to be confused with the CSI-dramas forensic autopsies of looking for signs of foul play). Others benefit too, adds Grice. In addition to targeted samples such as Schoenleber’s six brains and those used for CU School of Medicine teaching, there are more diverse buckets for onsite workshops for middle school and high school groups arranged through CU’s Office of Inclusion and Outreach. Grice and two graduate students, Sanjay Ranganathan and Jessie Geer, do the show-and-tell. Marshall has also created “student buckets” for loan to UCHealth nurses, medical school students and others. 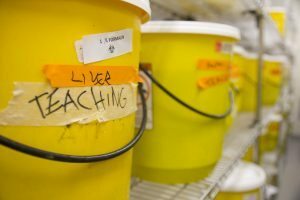 Among the samples in these buckets include sections from normal lungs and from those of a man with a long smoking history, blackened and with emphysema and squamous cell carcinoma; a healthy liver and that of a man with alcohol-related cirrhosis, and a healthy heart and one that had stopped beating after a heart attack. The aim is, in part, to “scare kids into practicing good habits,” Marshall says. If a recent thank-you note from a fifth grader is any indication, it seems to be working. “I learned that when you’re unhealthy bad stuff happens to your body,” the child wrote. The Organ Room specimens help teach medical students and many others. To borrow a bucket, one can can fill out an online form and, soon enough, show a son’s football team what a brain with CTE looks like, Grice says. CU medical students Whitney Sumner and Alexander Schulick recently checked out three buckets and brought them to an annual event at Breakthrough Kent Denver, a nonprofit program for underserved middle school students in Denver and Englewood. They put organs on trays to look at and even touch, Schulick says. Then, at an ultrasound station next to it, they could see images of those same organs in their own bodies. Schulick and Sumner pointed out diseases and answered questions. Regardless, Schulick adds, they definitely made an impression.